Mercedes just confirmed that they would be launching their SLK 55 AMG in India on 2nd December 2013. 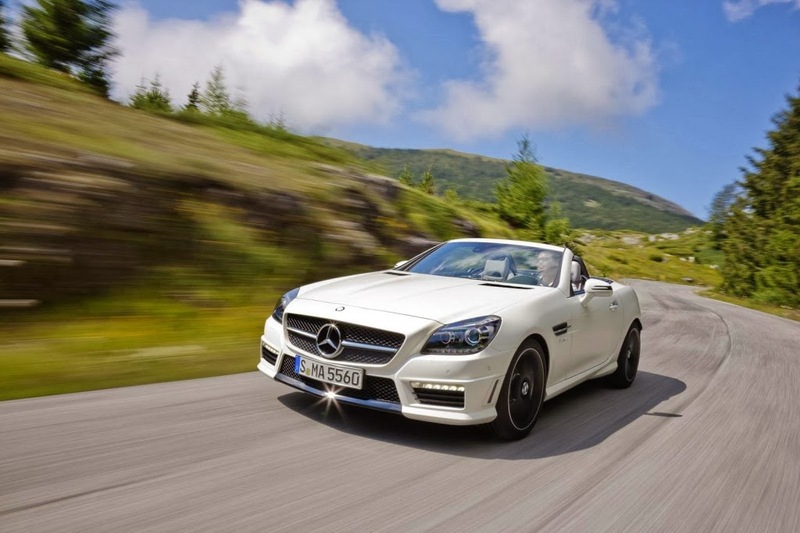 The SLK 55 AMG is powered by a 5.5-liter naturally aspirated V8 motor that punches out 421 hp. Thanks to this more than healthy output, the SLK accelerates from 0-100 kph in 4.6 seconds and reaches an electronically limited top-speed of 250 kph. The car is driven through an AMG SPEEDSHIFT 7G-TRONIC PLUS seven-speed automatic transmission which offers three driving modes – Controlled Efficiency (C), Sport (S) and Manual (M). To differentiate the SLK 55 AMG from the regular SLK, visually and mechanically, AMG fits the car with front and rear aprons and side skirting, ventilated and perforated disc brakes, AMG sports suspension, Nappa leather upholstery, and 18-inch AMG alloy wheels. The launch of the Mercedes SLK will be followed by that of the new generation S CLass in January. The new S Class will come to us via CKD route and is looking all poised to redefine the ultra luxury car segment of Indian car market. The new S Class will be launched in both petrol and diesel variants. Stay tuned to Wheel-O-Mania for more details.